Shopping for Legend of Zelda Action Figures? Have a nice nap, Link? From the open-world action-adventure video game comes The Legend of Zelda: Breath of the Wild Link Nendoroid Action Figure - DX Edition! The figure includes two different expressions, smiling and shouting face, as well as his sword, shield, bow, arrow, and even the Sheikah Slate! But that's not all! 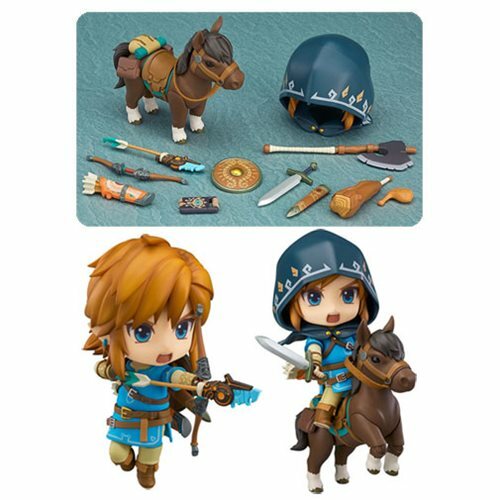 The Legend of Zelda: Breath of the Wild Link Nendoroid Action Figure - DX Edition also comes with a hood for Link, a club, an axe, and a horse, so our main character doesn't get exhausted traveling from place to place. Link figure measures approximately 4-inches tall. Ages 15 and up. The Legend of Zelda: Breath of the Wild is an open-world action-adventure video game developed and published by Nintendo for the Nintendo Switch and Wii U video game consoles. It is the 19th main instalment in the The Legend of Zelda series and the first original game in the series developed with an HD resolution. The story is set in Hyrule and follows amnesiac protagonist Link, who awakens from a 100-year slumber to a mysterious voice that guides him to defeat Calamity Ganon.